or in the Android or iOS apps, and visit the Photos section. While you’re there, you can also give your business a fresh look online by updating your profile, logo and cover photos. We’ll also guide you through adding the best photos to show off what makes your business unique. For example, hotels will receive guidance for adding exterior, room and common space photos that show guests what to expect inside and out. Cafes and restaurants can get customers drooling over their latest food and drink and provide more details with a menu photo. 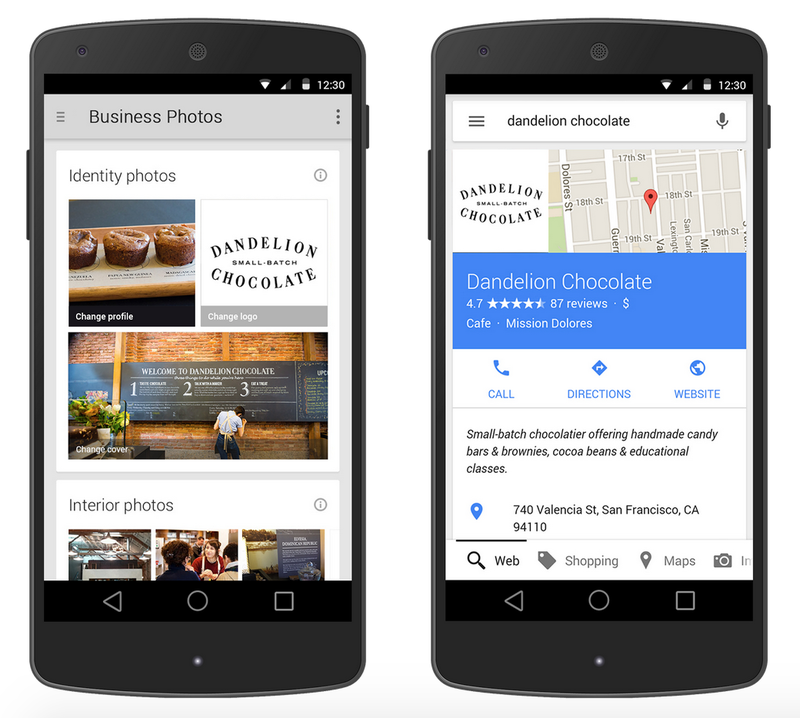 Log in to Google My Business today to see suggestions of photos to add for your business. When it comes to attracting new customers, photos can both entice customers to your business when they’re browsing online and give customers confidence that they’ve come to the right place. Starting today, you can tell us which image you’d like to appear when customers search for your business on Google. Just log in to Google My Business on the web or in the Android or iOS apps, and visit the Photos section. While you’re there, you can also give your business a fresh look online by updating your profile, logo and cover photos. Today we’re introducing call-only campaigns, a new and easy way for businesses to reach potential customers by prominently showing your phone number, business description and call button -- right when people are searching. Call-only campaigns are specially designed to only show on mobile devices that can make phone calls. This means every click you pay for can be a phone call to your business. Since every click goes towards a phone call, you can design a bidding strategy based specifically on your CPA or ROAS goal for calls. This helps you maximize the value of every call to your business. “Our customers are increasingly calling us on their mobile devices to get an insurance quote. The great part about call-only ads is that they give us the ability to bid based on the value of a call so we can meet the specific ROI goals that we have set up for sales that come through the phone." 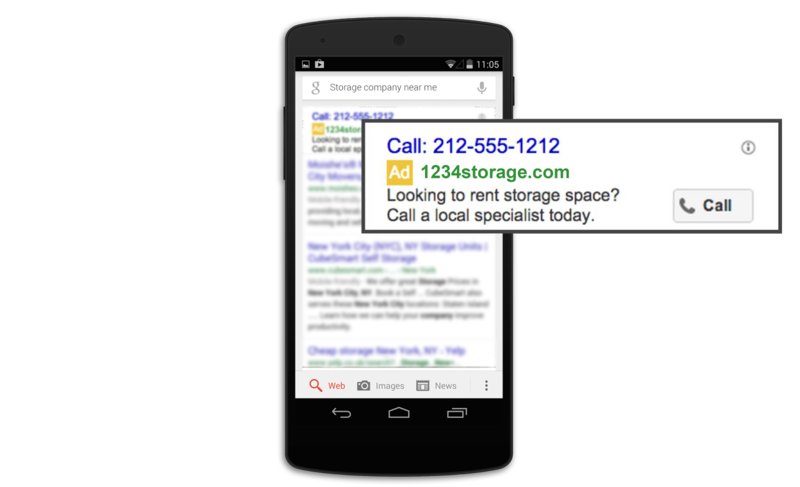 Tailor your ads for phone calls with creatives like “speak to a specialist today" or “call to make an appointment" to let people know they can easily reach your business without needing to visit your site. If you’re currently using the call extensions setting to create call-only ads, you can find details on how to upgrade to call-only campaigns in the AdWords Help Center. *Google/Ipsos, The Role of Click to Call in the Path to Purchase, September, 2013. With a mission to help small businesses to get the help they need to succeed on the web, the Google Small Business Community team connects small business owners to experts and each other every day. In addition to our monthly Hangouts on Air, we’re now excited to bring you more ways to connect with experts to answer your most pressing questions. Each month, we will have experts spanning different fields pertaining to small businesses. This month, our theme is productivity and we have three experts in to lend their advice. Ray Ramon is joining us from InfusionSoft, a company that helps small businesses streamline their marketing processes. We have Jamie Viggiano from TaskRabbit, a task-based service that helps small businesses find temporary help. We’ll also have some experts from the Google for Work team to talk about cloud-based tools that help you and your team work better, together. What are some topics you’d like us to cover in our monthly Office Hours? Join the Google Small Business Community and let us know. Since its inception, the Internet has been a powerful platform to share knowledge, connect with others, and search for information. We turn to the web to learn how to look great, make a killer banh mi, impress a French woman, speak, play, learn, and live -- the list goes on. Indeed, more people search for “how” than any of the five “W”s, finding their answers in blogs, videos, online books, interactive tutorials and other corners of the web. That’s why we’re happy to introduce .HOW as the latest domain from Google Registry, and the most recent addition to our broader effort to bring new spaces online. We believe .HOW can become an intuitive way for creators and consumers to share, identify and discover some of the best learning content on the web. Now you can buy a simple, memorable and meaningful .HOW domain name of your own, sending a clear message that your content is there to teach people something great. People are already getting started. 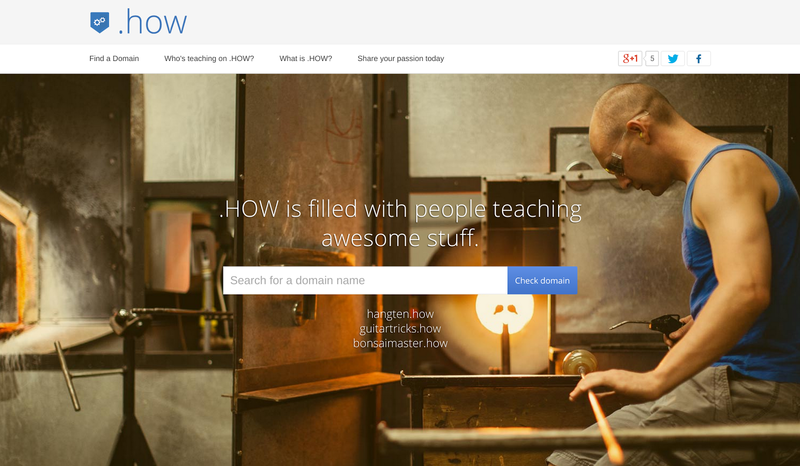 From sustainable renovators to a cappella aces, champion skydivers to video game makers; small businesses, nonprofits and teachers of all kinds are using .HOW domain names to reach their audiences. What will you teach on your .HOW? Check www.get.how for more information, or to get your .HOW domain name now.